Located in the heart of the Smoky Mountains in East Tennessee, our 36-bed residential treatment facility tailors treatment plans to your insurance, health history, and addiction severity. While English Mountain’s residential rehab programs are available in 30 to 60-day periods, many residents end up prolonging their stay up to 90 days or more to deepen their recovery focus and strengthen their sobriety foundation. To further support healing for the entire family, we also provide family education and counseling. 30-60 Days: When a long-term care program is not feasible due to financial, professional, or family obligations, English Mountain Recovery accepts clients searching for 30, 45 and 60-day rehabs. No matter how long they stay, 100% of EMR participants receive transitional care that includes referrals for ongoing therapy, options for extended care, and sober living options. This transitional care protocol makes clients accountable for their choices while providing the support they need to succeed. 90+ Days: At English Mountain Recovery, our mantra is that time is a recovering client’s best friend—so we encourage clients to spend more rather than less time in recovery. New data supports that longer programs decrease the likelihood of relapse and improve sobriety outcomes. In fact, the National Institute of Drug Abuse (NIDA) calls 90-day programs the “gold standard” in treating alcohol and substance misuse. Building their personal recovery process on the 12-Step philosophy originated by Alcoholics Anonymous, EMR clients develop a sense of hope and purpose. We also believe that recovery from substance use should involve mind, body and spirit healing—so we round out the treatment experience with holistic options such as creative arts therapy, Equine Interaction Experience, experiential programs, spiritual advising, Trac9 relapse prevention, and psycho-education. 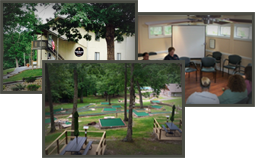 Whether you are seeking help for you or a loved one, our all-inclusive Tennessee residential facility is affordable and offers one of the industry’s highest recovery success rates. Contact an admissions advisor by phone at (877) 459-8595 or contact us online.